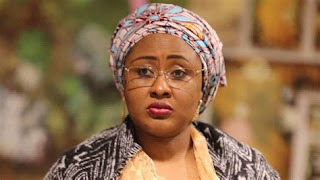 News Today earlier reported that Aisha on Tuesday said two powerful people were frustrating her husband’s effort in running the affairs of the country. She, however, failed to mention the names of the powerful persons. 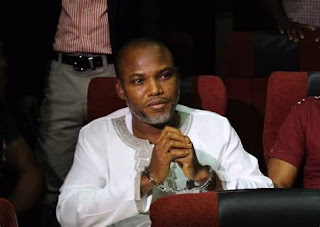 But Kanu in a live broadcast on Saturday commended Aisha for speaking against the ills in her husband’s administration while condemning the likes of Oby Ezekwesili and other activists. Appreciating Aisha, Kanu hoped that the president’s wife could be the next president of Nigeria. The Biafran leader also disclosed that Abba Kyari and Mamman Daura are the two men frustrating Buhari government and responsible for bringing Jubril of Sudan to Aso Rock. He said: “Why have Oby Ezekwesili and so-called activists not asked the government about those two people running the cabinets? “Common sense is not common in the zoo called Nigeria, why are people not outraged that two men are holding people hostage? “I have renewed respect for Aisha Buhari over her latest statement at a conference organized by Project 4+4 in Abuja on Tuesday and also women like Patience Jonathan, Dora Akunyili and Okonjo Iweala. “These women sometimes make me think Nigeria would have been a better place if a woman was the president. “It will be better for Nigerians to vote Aisha Buhari to be the President, she is very bold, truthful, frank and upright same as Patience Jonathan. “Considering what Aisha Buhari said, ask yourself, will she speak that way if her husband was still alive and not dead. “Aisha Buhari is basically asking Nigerians to rise up in a revolution because those people are now in charge. The question to ask her is ‘where is your husband? “Her statement is unbelievable, where are the men meant to stand up against these two people. “Also at the event was the wife of ‘cowardly’ vice president, Yemi Osinbajo who should be swept away. Osinbajo is a spineless coward, not a human being. “If Aisha had an opportunity, she would be harsher than I am, you see why I say Nigerian men are cowards, see what a woman is saying. “Look at Aisha Buhari telling elites to get up and do something about the government. Since men cannot do anything Aisha urged women to fight. “Aisha Buhari named two men in control of Nigeria, those men are Abba kyari and Mamman Daura. Those two people are ruling 180m Nigerians and responsible for bringing Jubril from Sudan to Nigeria. “These two men went to Sudan to replace Buhari because they wanted to retain power. “Aisha is telling you in coded language that her husband is no longer in Aso Rock, Nigerians should wake up. Recall her speech in 2016 where she said her man, it was at that stage that the idea of getting a replacement for Buhari arose. “I grade this woman highly for not shying away from issues in the country, I like Aisha because she is amazing and courageous. Now am beginning to look into this Jibril saga, I see so much sense in this revelation. Could Nnamdi be right?? These people are messing with our heads. But certainly, the truth will prevail at the right time.